Crest 3D White Luxe Glamorous White toothpaste is a forerunner in the world of whitening toothpastes. Created by Crest, one of the leading teeth whitening brands about, it can remove up to 100% of stains in just 3 days (view on Amazon). Good toothpastes are something that are often taken for granted, yet they can make all the difference when it comes to oral hygiene. Toothbrushing is a large portion of our oral cleaning regime, and a good toothpaste will effectively combat tooth decay and disease, leaving you with healthy teeth. But with so many different kinds of toothpastes to choose from, it’s hard to know where to begin. Whether you’re looking for a toothpaste that refreshes, whitens, or strengthens your teeth, deciphering which toothpastes are worth the money can be quite the challenge. In this review, we’ll address the 7 questions you need to ask when deciding if Crest 3D White Luxe Glamorous White Toothpaste is for you. While opinions on what makes a good toothpaste may differ from person to person, it is undisputed that it should not only clean your teeth effectively, but also protect and avoid doing damage to your teeth. As well as this, the ADA also has some recommendations regarding a good toothpaste. This should include at least 1000ppm fluoride (the ingredient responsible for strengthening tooth enamel) and the presence of artificial sweeteners instead of sugars. Furthermore, a good toothpaste should have a relative dentin abrasivity lower than 250 (so that it avoids damaging your teeth) and most importantly, help you to maintain a great oral health regime. How does Crest 3D White Glamorous White Toothpaste measure up? Makes you want to use it? The toothpaste comes with a wide cap which makes it easy for storage. The mint taste leaves your mouth feeling fresh after brushing. *Crest do not release the RDA of this particular toothpaste but all of their whitening toothpastes score over 150. As well as falling into the ADA’s “good toothpaste” category, Crest 3D White Luxe Glamorous White toothpaste also effectively whitens your teeth in just 3 days. Crest 3D White Glamorous White toothpaste aims to target surface stains and create whiter teeth with as little effort as possible. Unfortunately, like many whitening toothpastes , this toothpaste targets surface stains, rather than deeper stains. However, with its competitive pricing and the experience that Crest brings to the table when it comes to whitening, it’s a good way to restore the natural whiteness of your smile. 1.) 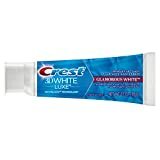 Does Crest 3D White Glamorous White toothpaste work? Crest 3D White Glamorous White toothpaste is effective in whitening the teeth with minimal effort. Teeth whitening has steadily risen in popularity in recent years, becoming one of the most popular requested cosmetic treatments. Your teeth can become discoloured for many different reasons. One of the most common factors contributing to yellowed teeth is the consumption of staining foods and drinks, such as coffee and red wine. Crest 3D White Glamorous White toothpaste combats these stains by the use of Sodium Hexametaphosphate, which helps to prevent surface stains to the teeth. Furthermore, the use of hydrated silica creates an exfoliating effect which is aids gentle but effective cleaning (view details). 2.) Will Crest 3D White Glamorous White toothpaste damage my teeth? Crest 3D White Luxe Glamorous White toothpaste makes use of sodium saccharin as a sweetener. This is important as the addition of saccharin instead of sugar means that your teeth won’t suffer at the hands of sugar damage. Furthermore, the whitening agents used in the toothpaste are the same enamel-safe technology which is often used by professionals in whitening treatments. The exact Relative Dentin Abrasivity score of this toothpaste is unknown. However, all Crest whitening toothpaste have an RDA of at least 150. This is on the higher end of the scale, but still under the ADA’s suggested safe limit of 250. After just one day of use, you can begin to notice that your teeth are looking brighter. You can expect to see noticeable results after just 3 days of use. However, in order for the toothpaste to be most effective, you should use it as recommended by the ADA: twice a day for two minutes a time. Full results can be seen from 5 days of correct use. How long your whiter teeth last for is dependent on your lifestyle. If you consume lots of staining foods, such as coffee and red wine, or smoke regularly, you can expect the results to fade quicker. This toothpaste is designed for use as and when it is needed – if you notice your teeth becoming discoloured again, just pick up the toothpaste and brush as usual! 5.) Does Crest 3D White Glamorous White toothpaste protect your teeth? The main ingredient in toothpastes which protect the tooth enamel is fluoride. The ADA recommends that toothpastes should contain more than 1000ppm fluoride. Crest 3D White Luxe Glamorous White toothpaste contains 1450ppm, which is well over this threshold. This is important, as fluoride helps to remineralize any weakened tooth enamel, as well as reversing early signs of tooth decay. 6.) How does Crest 3D White Glamorous White toothpaste taste? Crest 3D White Glamorous White toothpaste comes in just one flavor: mint. This resembles a spearmint taste, and leaves you feeling nice and fresh post-brushing. This toothpaste is ideal if you’re looking for an easy whitening product which is both safe and effective. However, as it contains a mild abrasive (hydrated silica), if you have sensitive teeth or are worried about the effect this may have on your teeth, then Sensodyne True White toothpaste may be more suitable for you. If you are looking for a product which penetrates into the teeth for deep whitening, try the Go Smile On The Go Sonic Blue Whitening kit. Crest 3D White Luxe Glamorous White toothpaste is effective when it comes to teeth whitening. The unique formula surrounds the teeth with whitening ingredients, and results can be observed in just a matter of days (view details). Furthermore, the toothpaste is easy to store thanks to its wide lid, and leaves your mouth feeling refreshed after use. Can you drink coffee whilst you’re in a period of using this toothpaste? You can, but bear in mind that drinking coffee will slow down the whitening process and you may not see as good results as if you avoided it. Do you use this in place of your usual toothpaste, or should it be used in addition? You should use this in place of your normal toothpaste. No, it no longer contains microbeads. What happens if I use this with an electric toothbrush? You can use Crest 3D Glamorous White toothpaste with any kind of toothbrush – electric or manual. Therefore, all you need to do is just brush as usual and wait to see the difference! Is it safe to use on crowns? While it should be safe to use on crowns, it will not change their colour. However, if you do have crowns – or any other kind of dental work – and would like to use this toothpaste, you should consult your dentist prior to use. Can I use whitening strips at the same time as this toothpaste? The toothpaste is a whitening toothpaste, and therefore contains a safe amount of whitening agent on its own. Therefore, you should avoid using in conjunction with other whitening products, unless recommended by your dentist or stated by the manufacturer. No – it only comes in mint.